I have to admit, all photos in your blog are very beautiful..! love the way you used the scarf, it looks great!! PERFEITO! Julia que look lindo. você arrasou! whta a good idea the big scarf as a ponchos!!!! i think im gonna try it!!! Love the stars...stars makes us sparkling!!!! You look so pretty in these photos, you always do, but I think its the lip shade your wearing, something is really bringing out your features. lovely. Great pictures, I love them ALL!! YOu´re wearing the Zara shoes I always wanted and that I´ve never bought because they´re sold out in my size all the time. Aren´t they to die for???!! Such a light, airy piece! Scarves are the best - they can be used for so many different things! Hello, i love you poncho is beautiful. Thanks for your post! Would love for you to follow! I'm your newest follower! I really love the scarf! love the idea of using the scarf as a poncho! great post darling! No había visto este post, o te habría comentado enseguida. Me encanta como te ves con ese azul.! We're loving your scarf!! You really are a star Juli!! Big hug!! I'm totally in love with you photos quality =D They are so amazing! Juli que buen look que llevas.Amo las estrellitas y concidero que son más IN que los lunares. Te sigo, Me seguis!? Gracias x tu comentario. En minutos renuevo post! 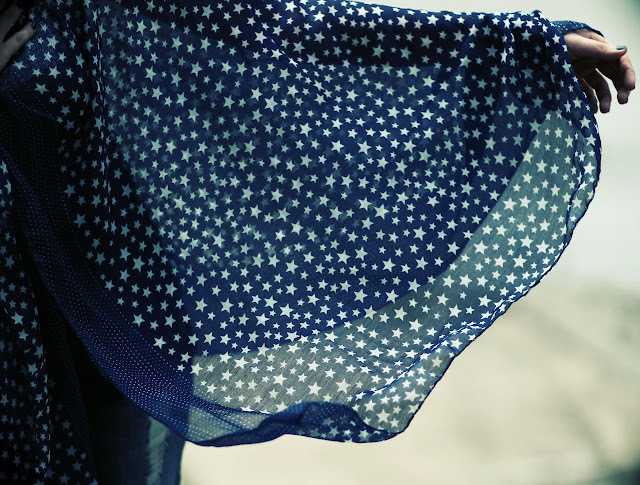 amazing amazing look, i really love this poncho, stars are amazing for all types of clothes! Hi! Thanks for your lovely comment! 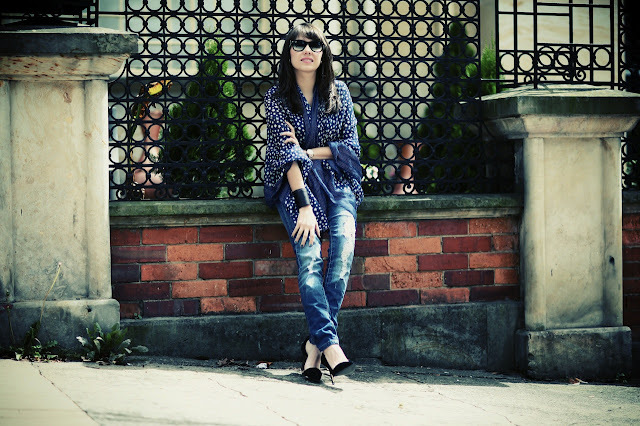 I love your style and your look! I follow you! LOVE the top! PERFECT with jeans! I love it, you look amazing!!!! me encatan esas estrellitaaaaaaas son muy originales!! Beautiful! I loved the look. We love your outfit , the photos are stuning ! Ps : Would you like us to follow eich other ?